it's 6:56am, 2nd Syawal 1429H corresponding to 3rd October 2008. I've just come back from my early morning run and managed to run 5km in 28:44 mins. 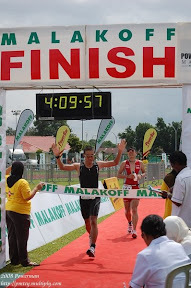 It was a very good run eventhough ada rasa gatal gatal arah muscles. I should have run yesterday therefore the title would be "1st Syawal Hari Raya Run" Hmmmm.....next year aku buat.